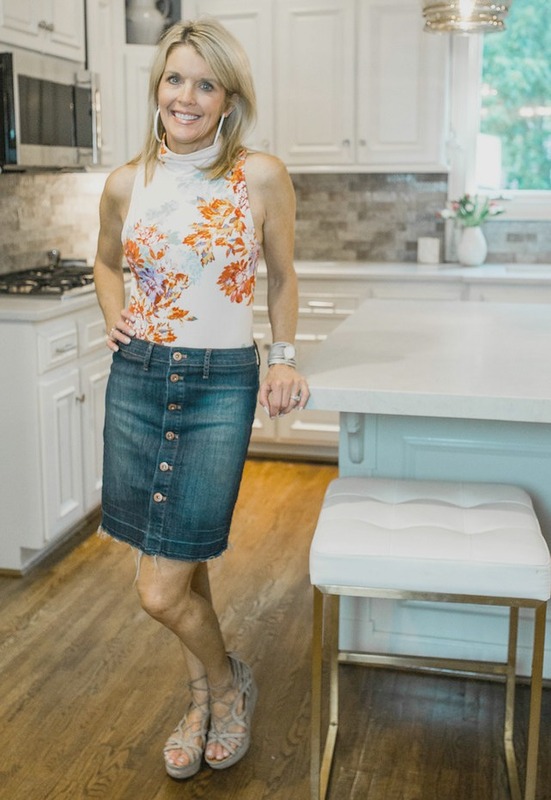 Here are a few savvy tips for how to look modest in a bodysuit ~for women over 50 who want to sport this trend with class. But bodysuits are going strong in the fashion world; they are literally everywhere. When I first saw them popping up in stores, my initial thought was, “I’ll never wear one of those.” I couldn’t imagine it looking appropriate on someone my age. But it really is easy to look chic and modest in a bodysuit by following a few guidelines. First of all, what IS a bodysuit? Basically, it is like a one-piece swimsuit or leotard made to wear as a top. The one I am wearing is the leotard type. It takes effort to make this style modest. It is not only form-fitting; it also has a large keyhole opening in the back. I have the Free People Pixie Bodysuit in two colors. It is currently on a major sale ($40 or less on most sites) and is a great summer staple. When I first saw it, I loved it and decided to figure out how to make it fit my over-50’s style:-) My tips for making it work are below. Size up one size. This rule of thumb applies to the tight leotard looking bodysuits. The Free People bodysuit I am wearing is super snug and form-fitting, so I sized up to a medium. It looks and feels so much better. For looser blouse-type bodysuits, sizing up wouldn’t be necessary. Buy the appropriate bra. The keyhole cutout in the back of the Free People bodysuit will show straps unless you wear a low-back bra like the Free People low back bralette. I bought a black and a white in this bralette specifically for these bodysuits. Pair the bodysuit with a modest skirt or wide leg pants. Have you heard the fashion rule of thumb “pair tight tops with loose bottoms; pair loose tops with tight bottoms?” I think this is pretty spot on~both in terms of symmetry and modesty. For a form fitting bodysuit, I suggest wide-leg pants or a basic, knee length or longer skirt. Below are some great options. Have a cardigan or jacket to dress up and cover up as needed. I would wear the Pixie bodysuit to lunch with a friend but not to church~unless I threw a cardigan or jacket over it. Cardigans are a staple in my closet~especially neutral colors. I link to some faves below. What do you think about the bodysuit trend? Is it for you? Love it? Hate it? I’d LOVE to hear from any you, especially my over-50 friends, so please, share your thoughts below! As always, thanks so much for stopping by. Wishing you a joyful, blessed & savvy day!!! Hi Meredith! I just went in a linked all the items again; I have NO idea what happened! Sorry for the problem, and thank you for letting me know!!! Appreciate you! 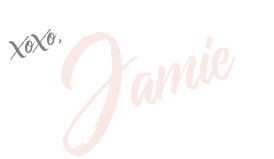 Hi Jamie, I could not access the link to the perfect pants, skirts and cardigans to wear over bodysuits….can you help! Love your blog!! Hi Betsy! You are the second person to ask about those; I JUST added the shoes to the post. Scroll to the very bottom “cardigans to wear with bodysuits” and the shoes are there. They are the BEST, most COMFY shoes in the world. I have them in 3 colors. They are still “hot” and on store shelves right now. I was in Gus Mayer today and saw them. Let me know if you find them in your size!!!! Awww thank you so much, Kim!!!! I am so glad you like it!!! Thanks so much for reaching out and leaving a comment. Love hearing from readers!!! Blessings to you, friend!! Love advice you give on fashion, food, products you use. Thanks for tips you really help especially when looking for fashion trends. This was great information! Also wanted to ask about the brand of your cute wedge sandal in these photos. Thanks.